I met Alan Templeton on Sunday at my father’s birthday party. He is the Charles Rebstock Professor of Biology at Washington University in St. Louis, Mo. We had an interesting discussion about his work and my interests in Science and Society despite the short time and my urge to follow a number of really, really interesting tangents. Most of our conversation was concentrated on his work with collared lizards in the Ozark Mountains of Missouri. Apart from being very cute, these lizards are interesting because, together with several other rare species of plants and animals, they live in a cool and rare habitat in the high Ozark Plateau called a ‘glade habitat.’ Although I am not sure I really understand what it is, it sounds a bit like islands of isolated desert with thin, poor topsoil, exposed rock, grasses, and some shrubs separated by dense hardwood forests with thick undergrowth. It seems that this glade habitat is shrinking, a series of isolated and geographically discontinuous, small islands where both plants and animals loose genetic diversity and face extinction. Wildfires played an important role in maintaining this habitat historically: the “islands” were larger, connected by migration corridors and surrounded by a savannah landscape, much more open than the Ozarks we see today. The answer had many parts. It turns out that he has experimental evidence. Using controlled burns and naturally occurring wildfires he can show how fire is needed to preserve glade habitat and he can measure the effect of fire on their unique populations of plants and animals. Here is a research paper he has published on the subject. But how does he know that he is restoring glade habitat and not creating it? 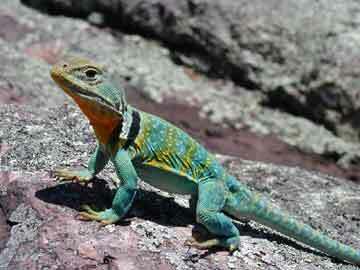 It seems that there are ways of looking at the genome of the lizard statistically that demonstrate that these communities of collared lizards are isolated into little pockets now but also that, in the past, they were able to travel and interbreed with nearby populations suggesting that their habitat was far more pervasive and included corridors for migration and gene flow between sub-populations. There may even be corroborating evidence from the first European settlers to the area who described a open landscape quite different to the Ozarks we know today. I really want to understand the statistics at some level but saved that discussion for another time… Reading history in the genome. Very cool. Finally the question “How do you know?” had other, qualitative dimensions as well: what was it like to learn what you know? What did you actually do? Unfortunately, we only scratched the surface. I learned a little bit about his experience getting permission for controlled burns and observation protocols across a variety of federal, state and private property: quite an accomplishment. Without getting into bureaucratic process or politics, he told me about how he held a simple "open house" in the mountains for local residents to meet scientists from St. Louis. Although Dr. Templeton and his colleagues weren’t sure anyone would even come, lots of their neighbors drove considerable distances to attend. Initially concerned that the conservationists would discover a rare species, bring in the Feds, and restrict their activities on their own land with a barrage of legislation, they were somewhere between suspicious and hostile at the beginning of the meeting. By the end, however, they became allies instead of adversaries. The ended up learning about the plants and animals on their land and even appreciating what the scientists were trying to accomplish. This is the stuff that is so urgently needed in so many public discussions involving scientific data, evidence, concepts and techniques. It provides social, political, cultural and economic context for the science: how we know what we know. It demonstrates that conservationists are looking for ways to incorporate sustainable human activities on the land as they protect habitat. The lay public can be motivated by curiosity, not just benefits. And, at the same time, it demonstrates that scientists are humans themselves, a part of society engaged in an exquisitly human and social activity called Science. But these kinds of qualitative questions about what scientists do and how they think are endless. What is it like catching lizards? What is it like driving on (or off) those roads? The idea of the open house and mixing of people living in the Ozarks and the scientists studying the Ozarks was particularly intriguing. What is it like working in Dr. Templeton’s lab? What is he like as a person? “And they bite,” he reminded me with a grin. I look at him with new respect and I realized that this is what the rest of society is missing: the texture of “how we do know.” He doesn’t sit in a lab and think about nature. He’s a skeptic who needs evidence to support what he believes. It’s important to hearing or reading personal stories that portray scientists as real human beings, especially if you don’t know one yourself. In conversation, his personal warmth and integrity are apparent. And if you know him personally or are a part of his extended professional or social community, it makes it much easier to assess, integrate and ultimately apply his scientific knowledge in your own life. But here is the problem: how many people in our society even know ONE research scientist? How would they read his work? How could they learn the answer to the question, “How does he know?” Unless you grow up in a family with scientists and engineers it’s just hard to imagine. The lay public will only encounter his work in highly edited and mediated forms with none of these personal qualities and none of the vigor of his original work: terribly dry textbooks in high school; exaggerated and alarmist glossy literature from the Left or the Right or their websites; or entertaining but ultimately not-very-informative shows on cable TV. And even if they were to discover one of his original publications, without the kind of context we are discussing here, it’s unclear to me anyway how they could understand it, making it useful and their own. It is a HUGE gap and a HUGE opportunity to make a contribution. I also asked Dr. Templeton if and how he communicated such personal qualities and personal experiences with his colleagues and the public, from the open house to the emotional, aesthetic and spiritual dimensions of his work. I was not surprised at all with his decidedly low-key answer. First of all, he looks for ways to impact communities like property owners in the Ozarks or land use managers in government and private organizations directly. He reaches out to them. Secondly, he welcomes print and television media exposure and, according to his website, has used them occasionally to promote and explain his research. And third, he shares his work in the community and his outreach practices within his professional circles. It turns out, at least partly as a result of his work, that there has also been an exchange of best practices between conservation scientists and land managers in the Bureau of Land Management, the Forest Service and the Nature Conservancy. All this is good; however, it seems that there remains plenty of work to be done. Stories like this one could have an impact on the management of public resources like water, air and fisheries for example, if they were more widely known. If the public understood and expected ideas like these in our public debate over energy policy or global warming, for example, just imagine how the tenor of the discussion would change. Where is the curiosity? Where is the concern for the integrity of the underlying Science? Where is the transparent inquiry and the public interest? I occasionally come across similar stories in the New York Times or on National Public Radio but they are rare. There is not a reliable and systematic means of communicating these kinds of stories to the public at large. We need to hear more about the role of scientists as impartial mediators, facilitating cooperation between landowners, citizens, business and civic leaders and conservationists. Protecting habitat is important, of course; but ultimately the integrity of scientific knowledge and channels of communication between stakeholders are even more important. Science can be a common ground, a haven in the highly charged and partisan battles over the environment if and only if we emphasize and refuse to compromise on a scientific foundation of curiosity, inquiry and our growing understanding of the natural world.